Today, we’ll be speaking about noise’s noxious younger sibling—harsh noise. Whereas noise, as an umbrella term, can often drift into dreamier, ephemeral realms (think My Bloody Valentine’s Loveless, Slowdive’s Souvlaki, or anything with the suffix “wave”), harsh noise rejects all function, all melody, opting instead to delve entirely into form, with sound functioning as deterrent. 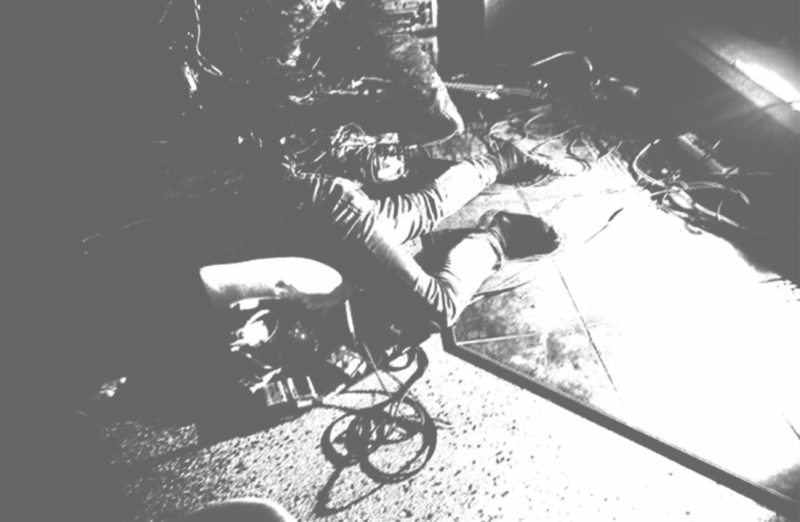 Harsh noise is brazenly anti-melodious, and it’s pretty difficult for the uninitiated to endure. To some, though, it’s a simple pleasure. Born of the most disillusioned sounds of the late twentieth century, harsh noise is a style that, through its removal of formal melodious structure, offers a much more open-ended experience, lacking the anchor of hooks and verses and totally without the marred, institutionalized impressions of progression or melody. I know it seems unlikely given the actual aesthetics of this sound, but harsh noise is a massively revered genre. There are numerous respected, renowned artists within the scene, making their livelihoods and touring the world with music that most average listeners only associate with sitting between stations on a radio dial. People like Prurient, Whitehouse, Macronympha and Pharmakon, just to name a few, have found a welcoming niche for their adventures in sonic experience. On Thursday, I tripped down to Casa del Popolo, a local denizen for noise fans since house promoter Daniel Pelissier began consistently booking harsh acts. The evening’s bill was stacked with local favourites—three harsh noise heavy weights: Harsh Reality, GRKZGL, and Hyena Hive. Coincidentally, this bill forms a fabulous range of characteristic variables within the genre. Harsh Reality opened with 15 minutes of crescendo. They’re a full band in the classical rock sense (drums, two guitars, bass), but they’re utilized antithetically—the look of an average four-piece band, rejecting instrumentation in the expected sense. Guitars are used as electrical conductors, emitting screams of distorted feedback, throwing the listener straight into peaking noise with absolutely zero warning. Rhythms are non-existent, instead punctuating the unpredictable screaming soundscapes occasionally exploding out of the bedlam, plus creating layers of percussive noise to fill any spaces even close to silence. Fifteen minutes felt like a year, and it was incredible. GRKZGL followed, showcasing the more primitive, “easy-going” aspects of the genre. A single man in front of a row of electronics, GRKZGL is always beginning, not so much building layers as offering them for moments, and then ripping them away. Yet again, expectations are rebuffed—nothing is built, nothing is anchored. A din of peal noise and unmatched, unpredictable layering created a sort of musical cognitive dissonance, building an expectation and then ripping it away, over and over. Again, the audience was thrown into a landscape offering no solace, no place to hang the hat or sit in comfort. There was no concept of linearity, no progress existing outside of the march of time. Too loud to be ignored, the erratic field samples and mind-bending static frequencies reverberated without delivering even a semblance of answers or resolution. You must look it in the face, but the face is either out of focus or glitching, screaming. After a half hour, he ended, abruptly—sudden silence, a paltry “thanks” echoed out in the wake. Hyena Hive closed, and represented the most diva aspects of the genre. Rebuking the stage for the floor, the two members lay their pedals out, one lying on the ground—he seemed to be worshipping—the other towering over the crowd with bass in hand—he was at least 6’5” with a hard face half covered in black paint. Here was the only band that offered some semblance of an introduction. Hyena Hive represent the genre’s most violent tendencies, the ideology that truth must be beaten into the casual observer, that change only comes at the end of a gun’s barrel. Their set, a quick half hour (no more is needed to get the point across), combined aspects of performance art, discursive and brutal noise, and forced audience participation. At that point, the sound is expected—crashing layers of feedback over looped rhythms, actually offering the most anchoring in rhythm of the night. A beat was present, but largely ignored as waves and brief bursts of maelstrom frequencies exploded over the PA. There were the heavily distorted screams and growls, both amplified and not, of both frontmen reverberating over the audience. The only lighting was an extremely fast white strobe. Both artists violently thrashed their bodies about; at one point the bassist stormed into the crowd backwards, smashing the full beer glass of an unsuspecting onlooker onto the ground before ripping forward again. He then grabbed the strobe light, which was painfully bright, and slowly walked through the crowd, growling into the microphone as he held the light directly into audience faces, one by one. The through line of these sounds, disparate but under the same umbrella term, is a rejection of expectation, and a lack of anchoring. None offer a place to stand, a feeling of safety—instead you are thrown into a cacophony, a bedlam of sound. All at once, all musical truths you’ve been taught are torn asunder, and you’re whipped into something totally foreign. I know that harsh noise is disconcerting and difficult to consume, but these aspects are what make the genre such fertile creative soil. In rejection of function for the embrace of form, in plainly eschewing melody for cacophony, harsh noise offers an entirely new set of values of judging music. Just look past that initial recoiling in the face of ugliness, and the entire palate with which you consume music will be forever altered.